The Creek Club is the only private course at Reynolds Lake Oconee, and the experience differs from the resort courses in the small details. 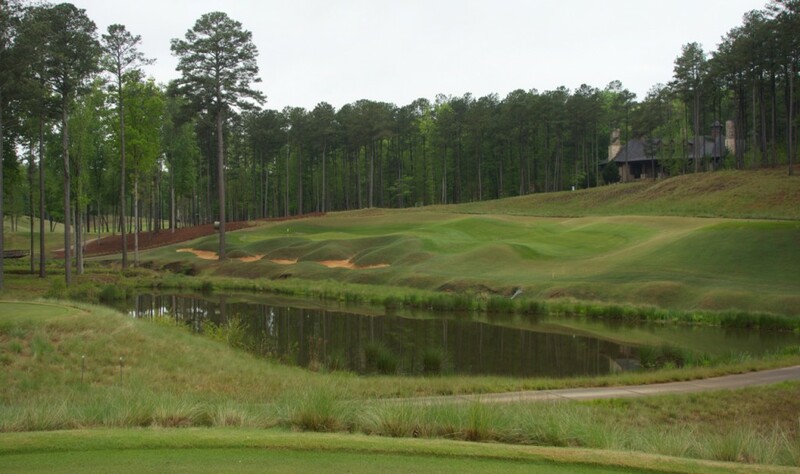 Due to the comparatively little amount of play on the course, the Creek Club is able to do things differently. 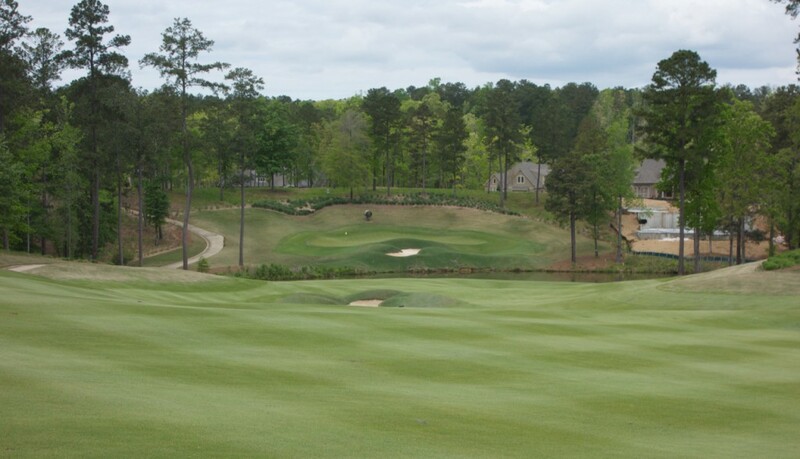 For instance, the Creek greens are very fast bent grass, which is rare for a course in the Georgia heat. The small differences take the really nice resort experience and kick it up to a great private club experience. The members at Reynolds’ Creek Club are fortunate to have both. 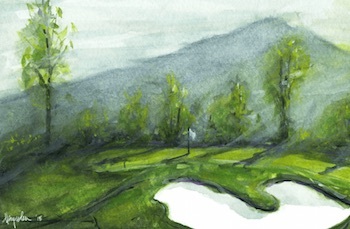 You catch peeks of the golf course during the drive into the Creek Club. 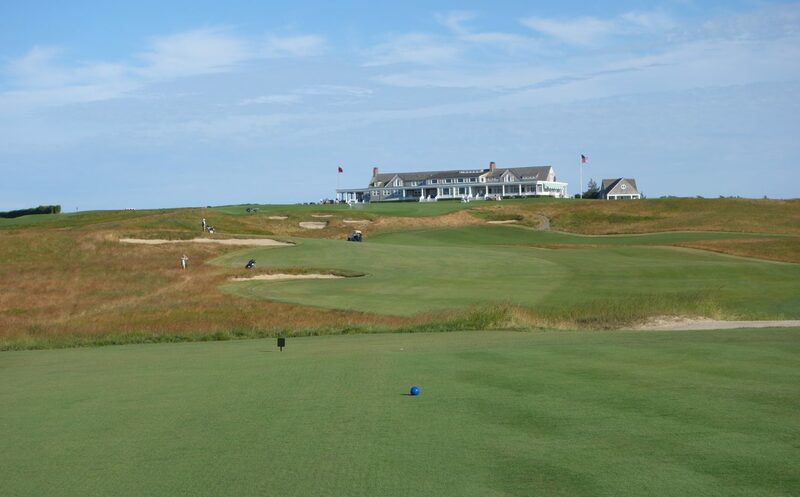 Admittedly, I hadn’t done much reading about the course or research on Jim Engh prior to the round, but I was told that an Engh design is unlike any other. “Contrived,” “fun,” and “crazy,” were all mentioned over drinks at the Ritz-Carlton the night before the round. The story goes that the Reynolds family tasked Engh with creating a course unlike the other 6 on their property. What Engh gave them is a course with some of the most extremely undulating greens I have ever seen. The greens were divisive among our group and some of the comments on social media echoed my partners’ concerns. 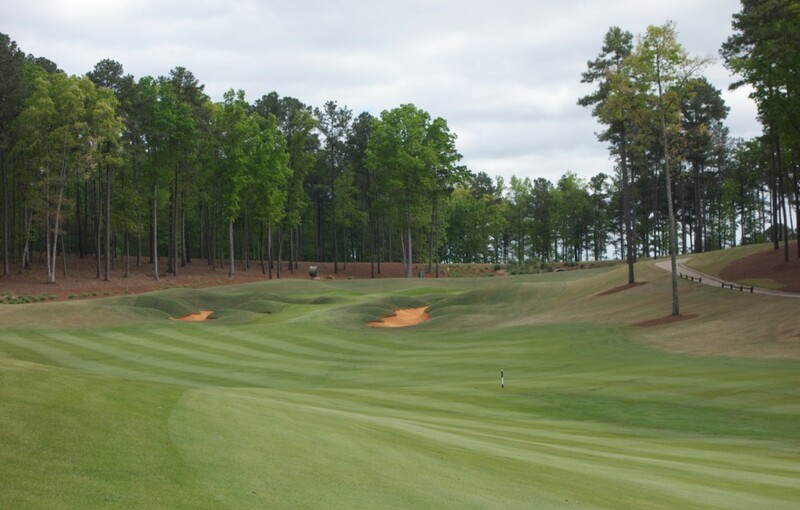 “The greens are too extreme… you can hit a great shot and have it end 60 feet from the hole. 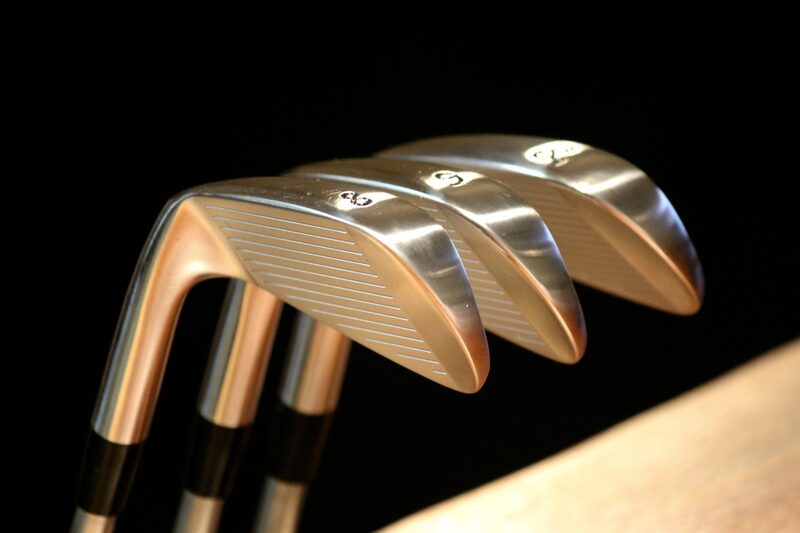 A bad shot can catch the correct slope and end inches from the hole. 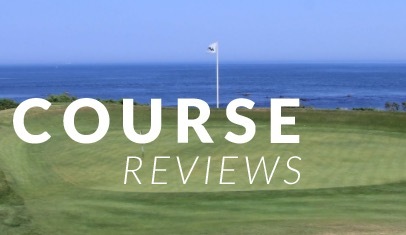 Plus, the course is too short, I mean, look at the rating, it’s 69 on a par 72.” My response: I understand the architectural points, but you just hit the nail on the head with what I enjoyed most about the course. It is a total departure from the difficult and “fair” courses that we all play week in and week out. I loved watching shots funnel toward a hole sitting at the bottom of a huge bowl. I laughed as my well struck 4-iron caught the wrong slope on 11 and ended 80 feet from the hole. 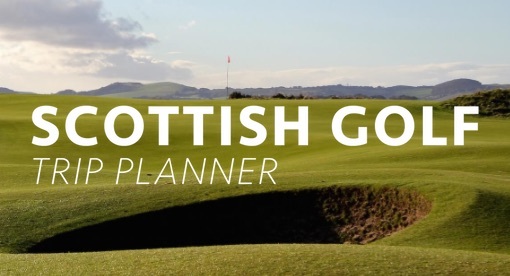 If you’re too concerned with your score or architectural purism to smile and laugh at those breaks, then free up the tee time and I’ll meet you at a “fair” course for a pint after golf. Despite the weatherman’s call for rain during our round, it opened up into a beautiful day for our round. You’ll notice the course photographed better as the sun came out later in the round, so don’t mistake the front nine for less picturesque. Also, note that the yardages are from the second furthest set of tees. However, most members play the “benches,” which are a combination of this set and the tips. 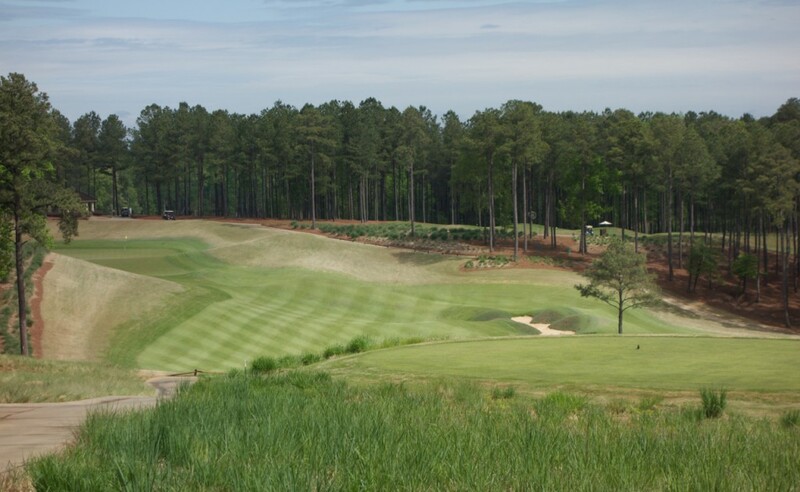 Hole #1 – 535 yards – The opening par 5 requires a big tee shot to reach the green in two and two evil trees block the perfect line for a long approach from the middle of the fairway. 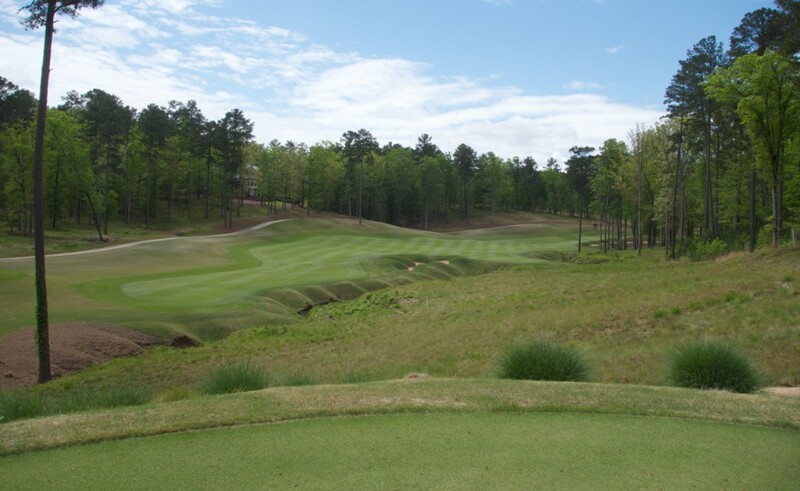 Hole #2 – 306 yards – This green is over 60 yards deep and two huge side slopes kick everything down to the putting surface. 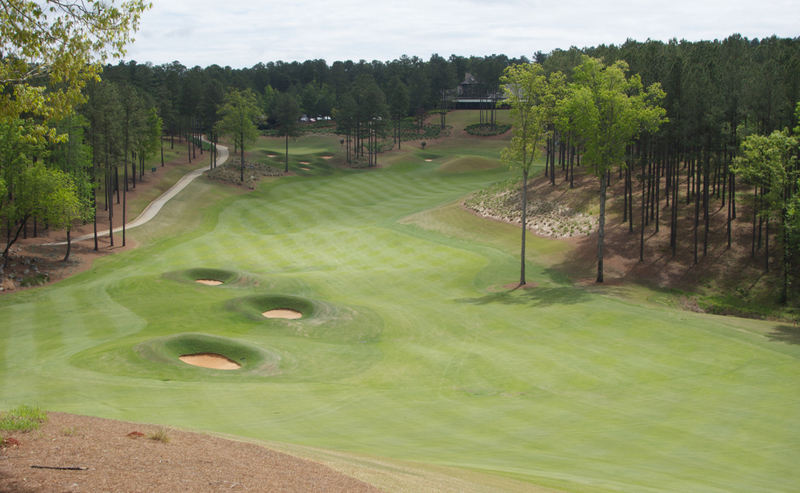 Hole #3 – 360 yards – There is more room left of those two fairways bunkers than you think, but they still rest squarely in your mind on this tee. 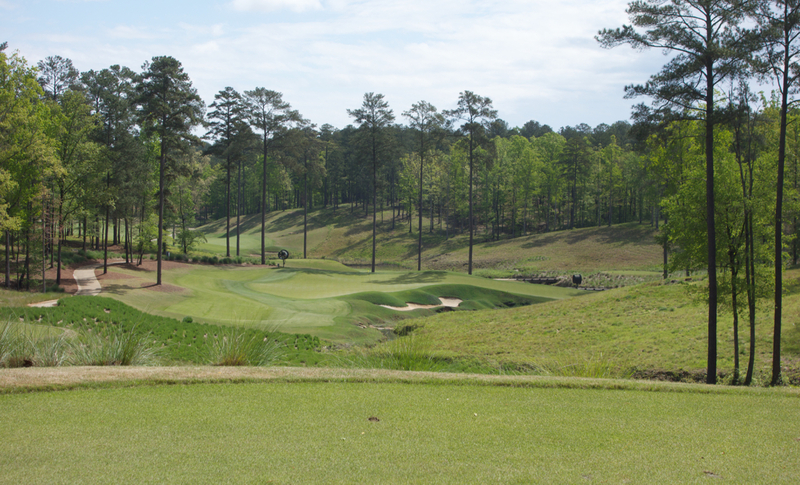 Hole #4 – 176 yards – The yardage on the scorecard doesn’t factor in this back pin position. 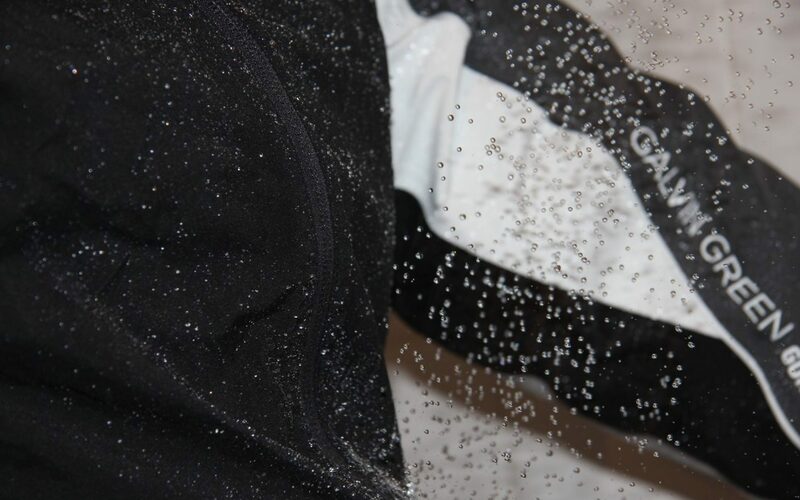 Get the ball over those slopes and it will funnel down to the hole! 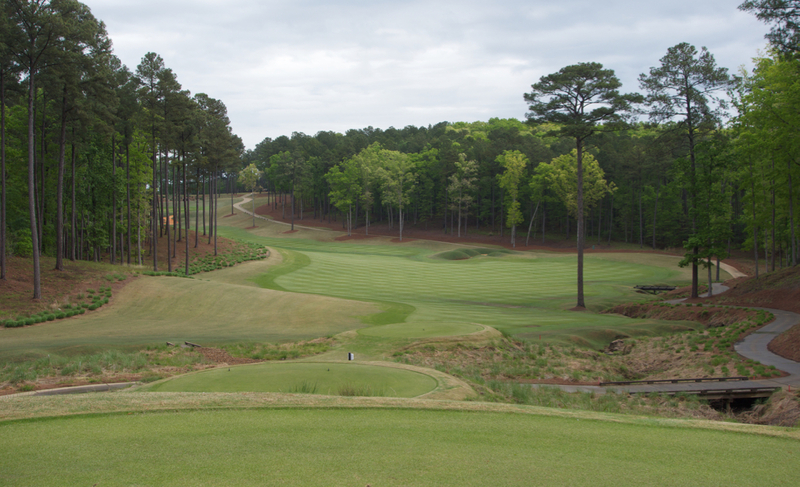 Hole #5 – 413 yards – This is the first of two split fairways on the course. I can’t imagine a scenario when you would want to hit it up the right side, but our host said members take that direct route from time to time. 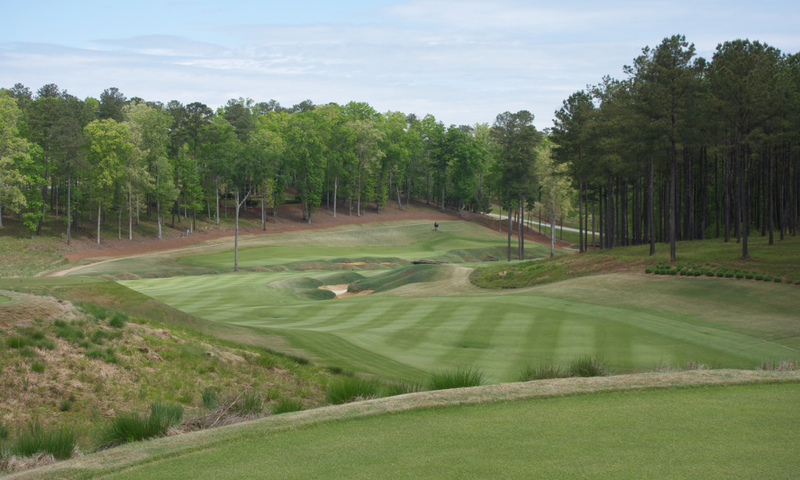 Hole #6 – 336 yards – The yardage may be short, but take extra club on the approach. The massive slope behind the green acts as a backstop to funnel approaches back onto the green. 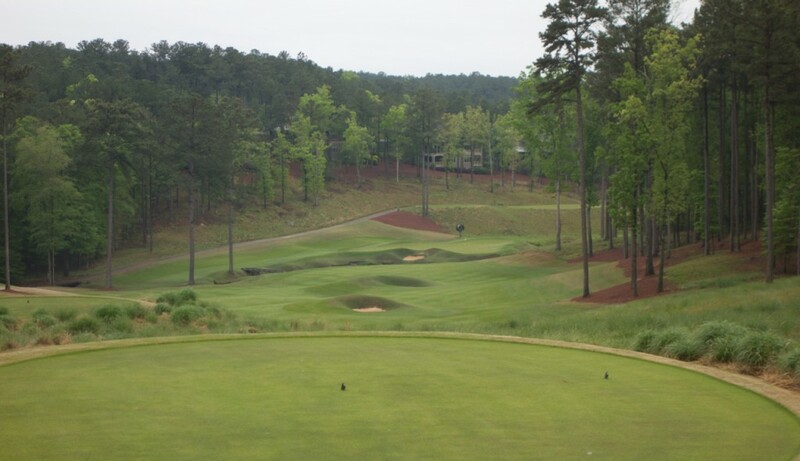 Hole #7 – 153 yards – This hole is a great example of the pin sitting at the bottom of a bowl. Shots long here come right back to the pin. 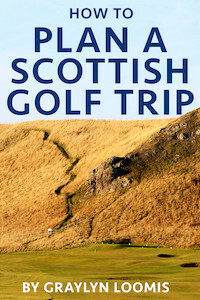 However, miss right or left and your ball carries a long way down slopes to either end of the green. Hole #8 – 497 yards – Play an extra club on this approach… I mistakenly didn’t and ended up in that deep front right bunker. 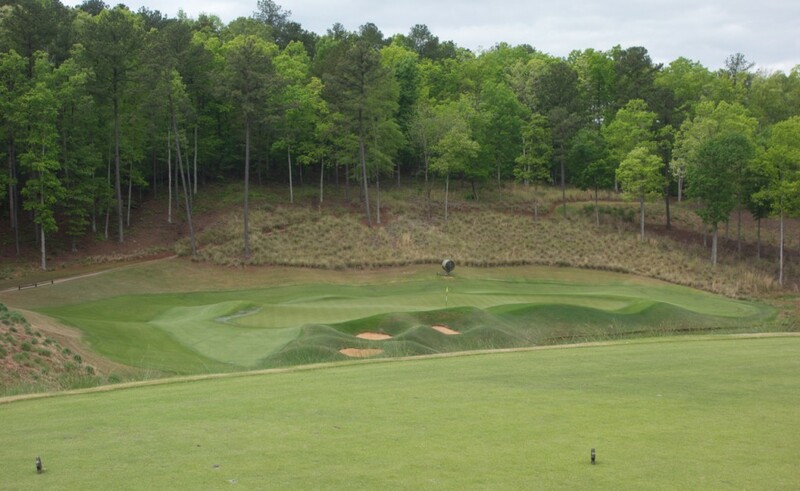 Hole #9 – 337 yards – This is one of the holes you see on the way to the range. That false front is 10-15 feet lower than the top tier. There is also enough room on the lower shelf for a pin placement. It would be so much fun to hit an approach into the slope and watch it come back to the hole. 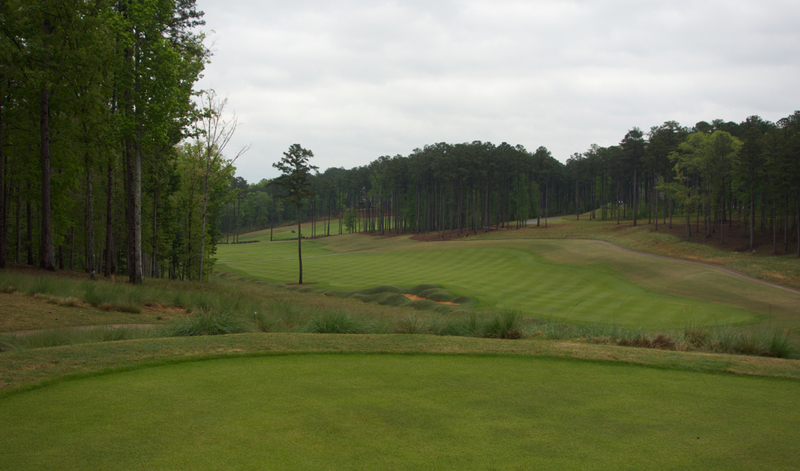 Hole #10 – 412 yards – Playing safe to the left leaves a much longer shot into this sloping green. 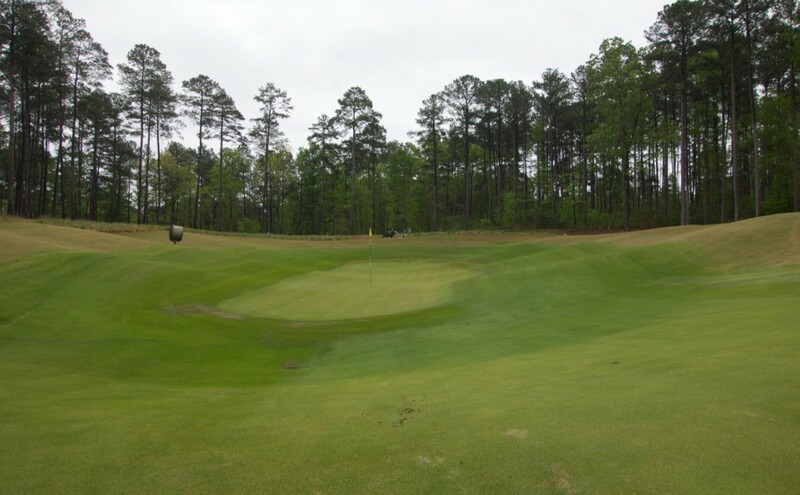 Hole 11 – #199 yards – You might not realize it, but this green extends another 20-30 feet right of what you can see here. The pin is on the left, and my 4-iron from 210 leaked slightly right of the pin. It then caught the slope and ran 80 feet or so right of the hole down a massive slope. While this would eat at many, how can you not laugh and smile?! For every bad break, the slopes kicks you close on others. 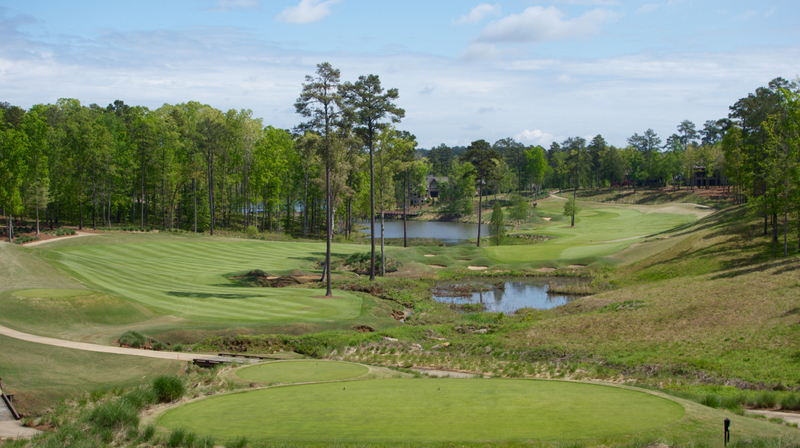 Hole #12 – 512 yards – Bold players take their drive up the right side. Distance isn’t the issue with that route. 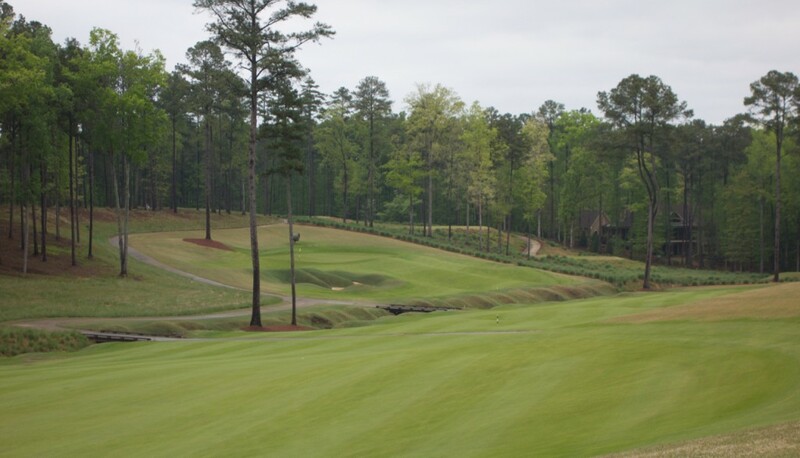 Instead, the fairways narrows considerably and kicks balls hard left into the marsh. 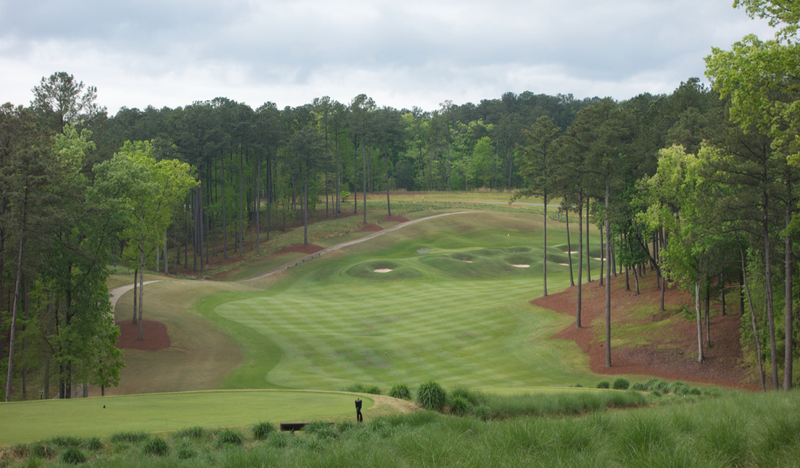 When the course is dry, a huge cut is the play into the right edge of the right fairway. 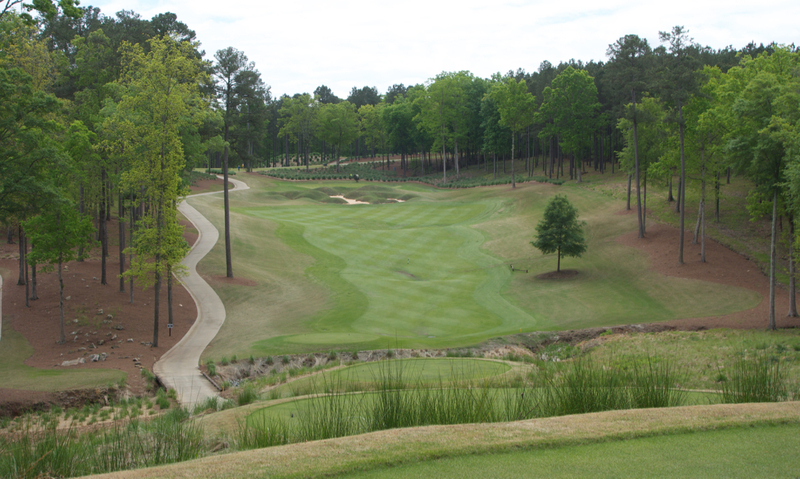 Hole #13 – 154 yards – This extremely long thin green curls all the way left around those trees. Rather than hitting a slinging draw, imagine bouncing a shot off the back right slope? This green won’t appeal to purists, but can you have more fun?! 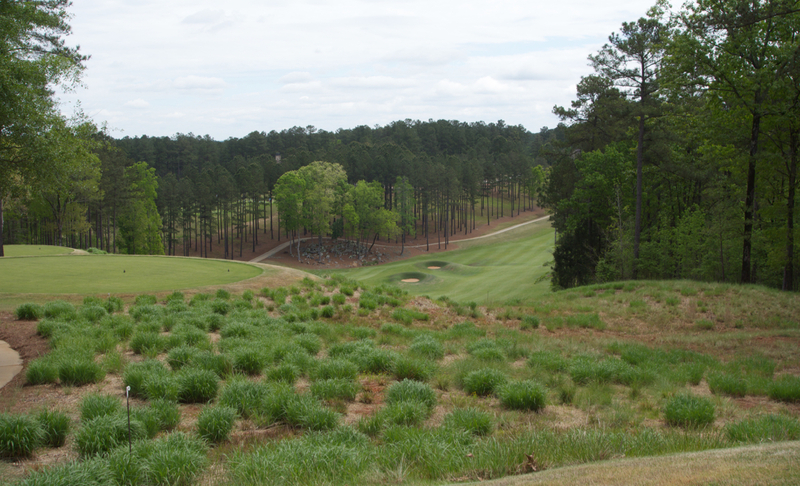 Hole #14 – 514 yards – The blind tee shot’s perfect line is right over the sighting bunker between the two hills. The huge backstop behind the green makes wedge shots fun and protects those who go for the green in two. 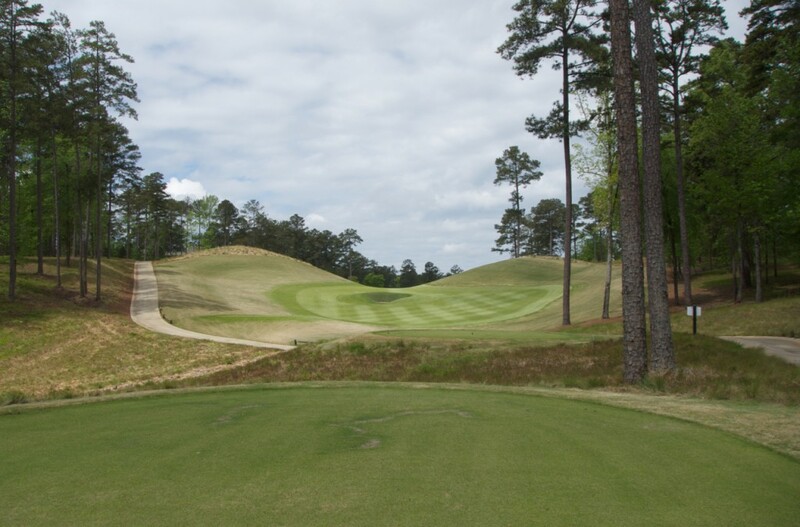 Hole #15 – 333 yards – Bite off as much as you can chew on this tee shot. The smarter play is further left, which opens up a nice angle into the green. 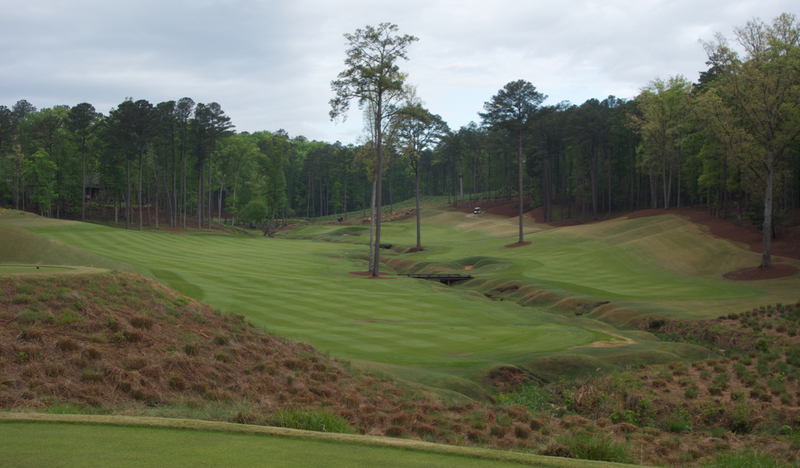 Hole #16 – 303 yards – Add on an extra club or two for this uphill approach shot. This was another tee shot on the course where I preferred laying back to a full club yardage. 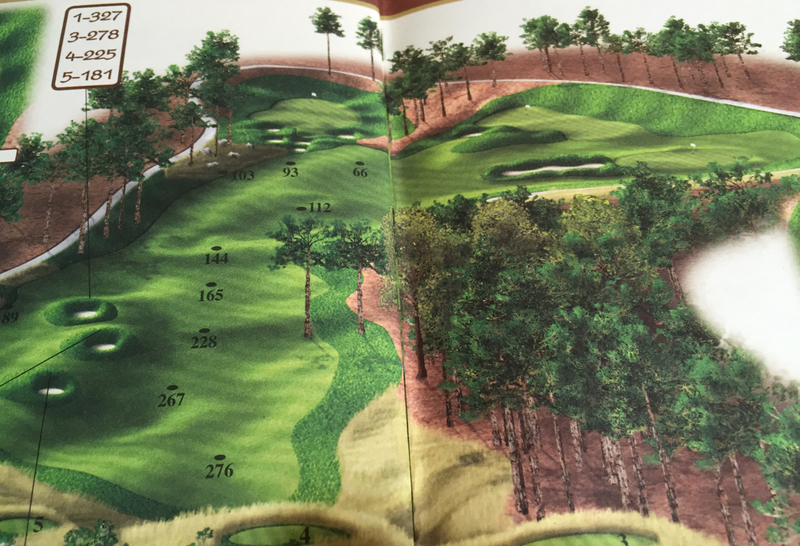 Hole #18 – 557 yards – Apparently Engh couldn’t decide between three green locations on the 18th hole…. so he built all three! The pin rotates between greens depending on the day. I couldn’t manage to get all three in the same photo, so this look at the yardage book (below) gives a better sense of the three sites. 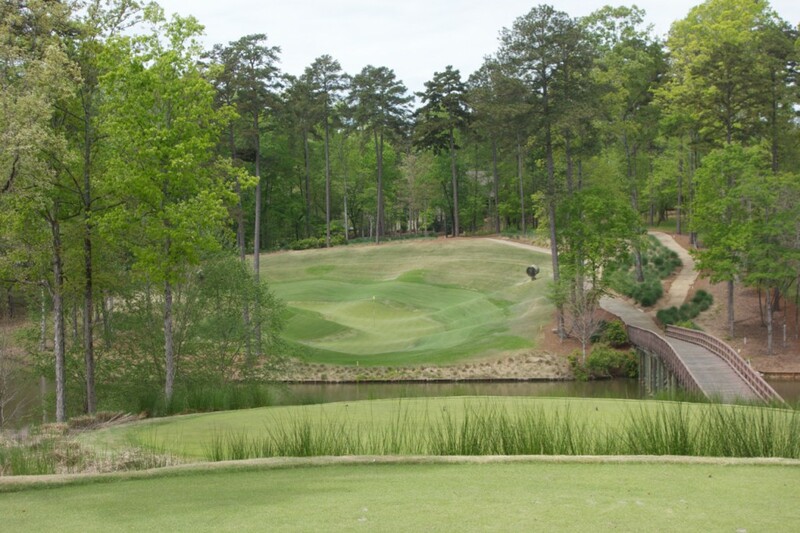 The Creek Club at Reynolds Lake Oconee was one of the most enjoyable rounds that I have played thus far in 2016. 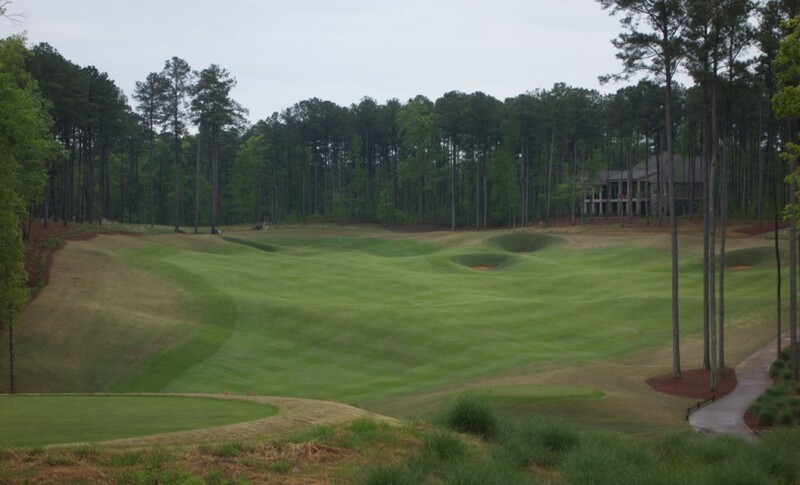 The sloping greens put a massive smile on your face. There are positive and negatives about them, like limited pin positions on some holes, but they inspire creativity and remind you why we play this game in the first place – it is fun! 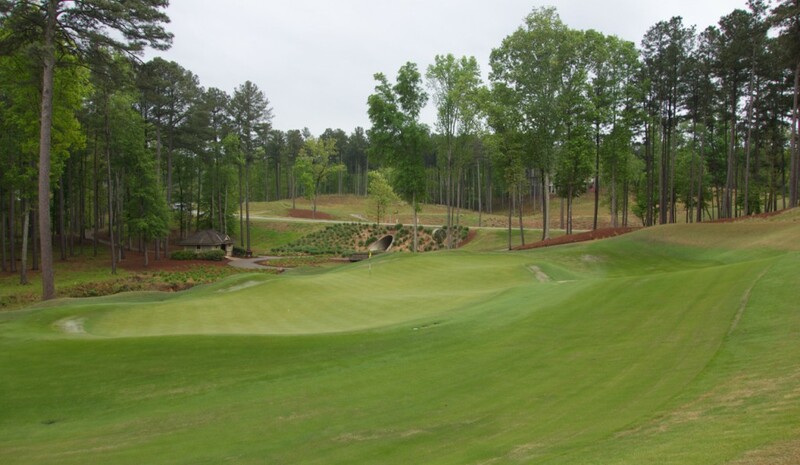 This is a beautiful course! My brother loves golf, and I know he would enjoy this. 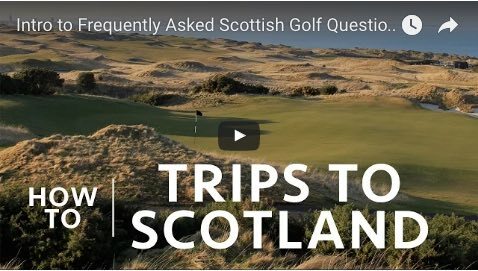 What do you have to do to gain access to a private club course? I like how this course forces you to relax and have fun with the game. That’s a nice change to have every now and then. Thanks for sharing! Hi April, Access to the course is provided through members, so the only way I know is to have a member host you as their guest for the day. I appreciate the comment!